Cylinders – 2.5” bore x 20” stroke, dual acting. PATENTED Retract lift system. Pump System – Monarch Fluid Power, 2,500 psi, 4 way valve, 12 volt system. 1/4” hose assemblies. 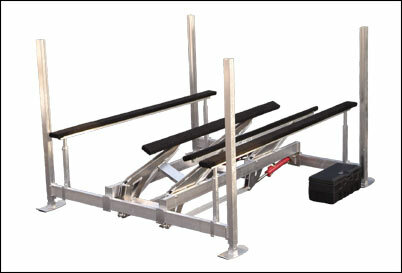 Water Depth 18" + 1/2 of boat draw for all models. Pontoon requires 0" with 40" beam, 6" with 120" beam. 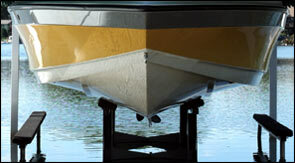 Whitepaper : "13 Features Every Hydraulic Boat Lift Should Have." Summit Marine wins Top Awards in Worlds Greatest. Blog Report - Take Charge and Don't Get Caught With a Dead Battery.